Y'know, this whole writing blog posts on "Friday" while really writing them on Saturday thing would work a lot better if I still lived in New Zealand. One of the things they don't put in the brochure is that you're perilously close to the frontiers of time itself down there, blazing a trail for the whole world through the hours to come. Which makes it possible to do things early on a Saturday and still have it count as Friday. In other news, time seems to have been on my mind lately. Someday I will turn it into a science fiction story full of wanderings and musings and coolnesses. I haven't posted a Friday Wordle in a while. Last week was a bear, writing wise. This week was better. I revised several chapters in Book Two of Soulwoven and finished a first draft of a sci-fi short story involving androids, virtual reality, ultimate fighting, newspaper clippings, first-person present narration, and several other things that I don't usually work with. It was fun, but difficult. It is now sitting quietly on my hard drive while I do other things and think occasionally about what I really want it to become. 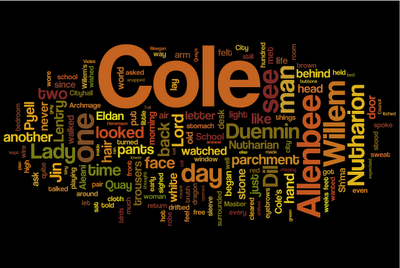 So I've picked one of the revised chapters in Soulwoven Book Two for the Wordle. It was hard to write, because while a lot happens, not a lot HAPPENS, if you know what I mean. There are important things afoot and the characters are unfurling their sails and much beauty exists to be described, but in terms of flash-bang-whizz-make-you-turn-the-page, it's a little sparse. In that environment, figuring out how to make you turn the page anyway can be challenging. It took me about three days to get this into a shape that I approved of. So yeah, there we go. I like the fact that the word "pants" appears prominently in this one. It opens with a funny scene involving Cole, a manservant he's been assigned, and a pair of white trousers. Interesting to me as well is the fact that Quay's name appears despite a lack of his physical presence. Speaks to what's on Cole's mind, I suppose. Lots of names in this one. New characters abound. I first wrote the chapter while under the influence of War and Peace, so there's quite a few drawing room, comedy of manners sorts of happenings. Anyway, I continue to ponder putting chapters of Soulwoven up on Wattpad. 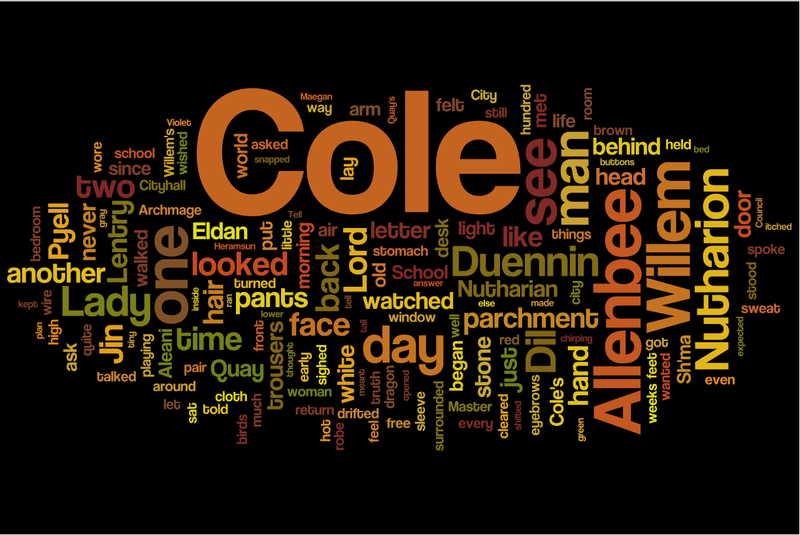 If a few more months go by without any bites from agents, I may just do it, at which point these weekly Wordles will probably change shape to accompany the chapters going up over there. Happy weekend. May it be full of flowers and sunshine and cool, spring temperatures.